MILWAUKEE, WIS.- The Milwaukee Art Museum brings haute couture to the city in Inspiring Beauty: 50 Years of Ebony Fashion Fair. Open now through May 3, it is a story of vision, innovation and power told through the prism of iconic fashion from Oscar de la Renta, Givenchy, Valentino, Dior, Pierre Cardin, Yves Saint-Laurent, Patrick Kelly and Emanuel Ungaro, among others. Ted Lapidus (French) 2 of 2 coordinating cocktail dresses (white), fall/winter 2000–01. Hand-painted silk faille, glass beads, plastic sequins, leather, cotton embroidery thread Lent by Johnson, LLC Chicago History Museum, Johnson Publishing. Inspiring Beauty is presented in three sections that explore the three major themes of the exhibition. The first section of the exhibition, Vision, explores Eunice Johnson’s role as the creative force behind the Ebony Fashion Fair. It features costumes that reflect power, affluence and influence, expressing some of the traveling show’s recurring aesthetic ideas. The second section of the exhibition, Innovation, looks at the boldness and experimentation of Johnson Publishing Company. Garments in this section reflect the full breadth of fashion fantasy that the traveling show brought audiences while the film highlights the historic significance of Johnson company publications. The final section, Power, features Inspiring Beauty’s most elaborate, luxurious and dramatic ensembles. Costumes by Valentino, Bob Mackie, Henry Jackson and Alexander McQueen reflect the glamour and showmanship that created the dynamic visual experience that audiences expected. “At the heart of this dynamic exhibition are the stunning gowns, feathered coats, and statement designs seen in the seventy-plus ensembles by designers including Valentino, Givenchy, Oscar de la Renta, Bob Mackie, Missoni, Patrick Kelly, Alexander McQueen, Christian Dior, Vivienne Westwood, and more, all selected from a collection of thousands that Mrs. Johnson amassed in five decades,” said Keegan. 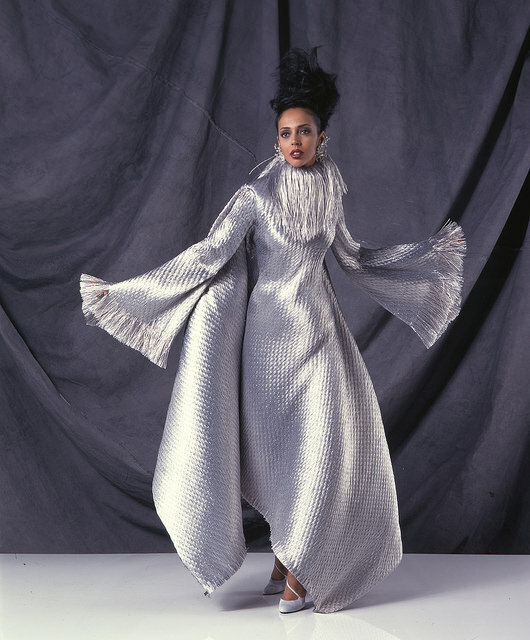 To celebrate Milwaukee’s local connection to the Ebony Fashion Fair, a section of the exhibition will include thirteen designer garments from Mount Mary University’s signature Ebony Fashion Fair collection, part of the its 10,000 piece Historic Costume Collection. Mount Mary’s selections will feature garments by Koos Van Den Akker, Vivienne Westwood, Thierry Mugler, and Anna Sui, among others. The Ebony Fashion Fair circuit included 170 stops each year, including Milwaukee. 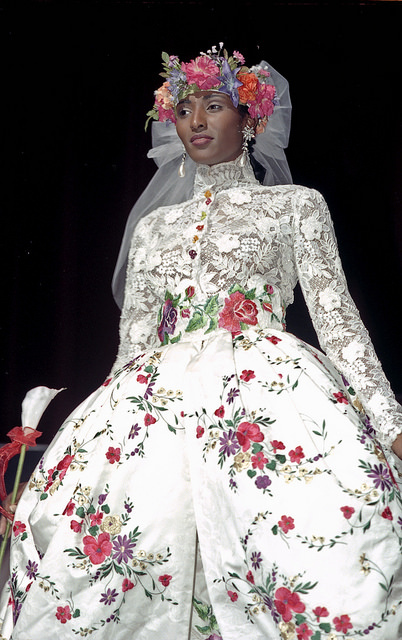 In addition to appearing at the now-defunct Garfield Theater on the city’s north side, Mount Mary University presented the Ebony Fashion Fair to sold-out audiences in its Kostka Theater on several occasions. Inspiring Beauty: 50 Years of Ebony Fashion Fair was developed by the Chicago History Museum in cooperation with Johnson Publishing Company, LLC, presented by the Costume Council of the Chicago History Museum, and toured by International Arts & Artists, Washington, DC. It is presented at the Milwaukee Art Museum by Mount Mary University, and supported by Harley-Davidson Motor Company, the Joseph R. Pabst Fund of the Greater Milwaukee Foundation, the Milwaukee Art Museum’s Friends of Art, Angela and Virgis Colbert, Potawatomi Hotel & Casino, Milwaukee (WI) Chapter The Links, Incorporated, and the Milwaukee Art Museum’s African American Art Alliance. 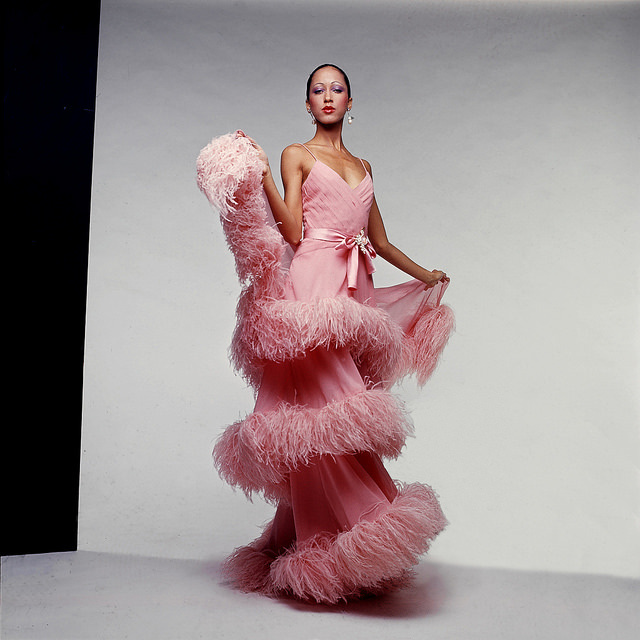 Inspiring Beauty: 50 Years of Ebony Fashion Fair is co-organized at the Museum by Camille Morgan, Exhibitions Curatorial Coordinator at Reva and David Logan Center for the Arts, University of Chicago and Monica Obniski, Demmer Curator of 20th and 21st Century Design at the Milwaukee Art Museum. It will be on view at the Milwaukee Art Museum February 5 through May 3, 2015. 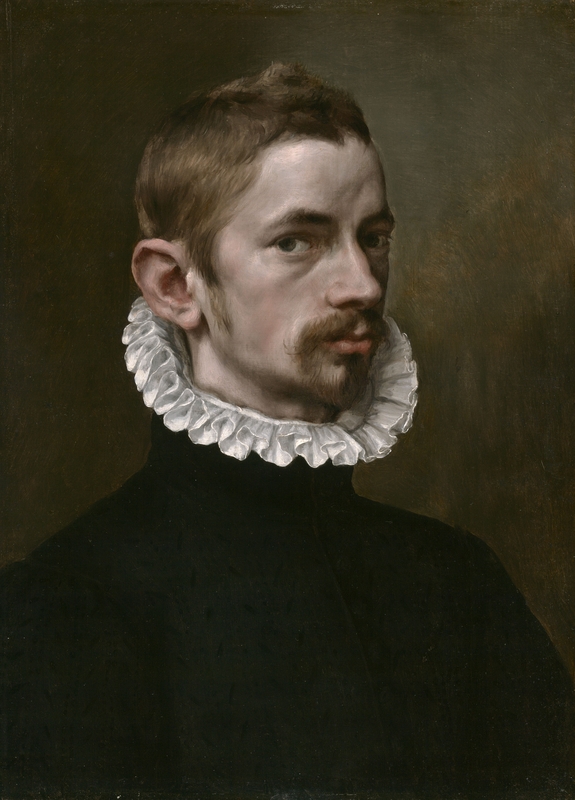 Anonymous master, Portrait of a Man, c. 1575, Art Institute of Chicago. BRUSSELS.- With around 50 exceptional portraits from the Low Countries Faces Then gives us a good overview of different portrait genres and their role in the 16th century. It is the first major retrospective of this subject since 1953. 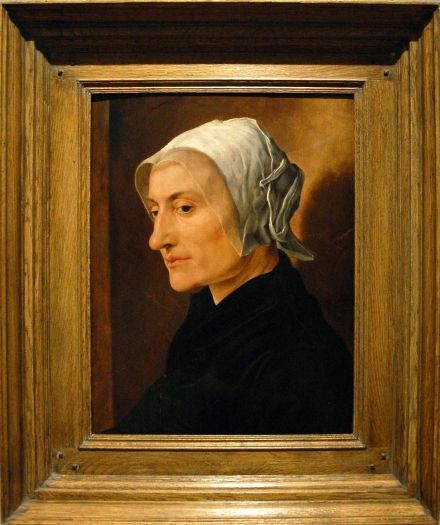 Marteen van Heemskerck, Portret van een oudere vrouw, c. 1530. Huile sur bois. Private Collection. The 16th century was the golden age of the portrait. For centuries only saints and monarchs enjoyed the privilege of having their portrait painted. As of the late 15th century the share of portraiture grew exponentially in line with the economy and meant that the bourgeoisie were now able to have themselves immortalised increasingly often. 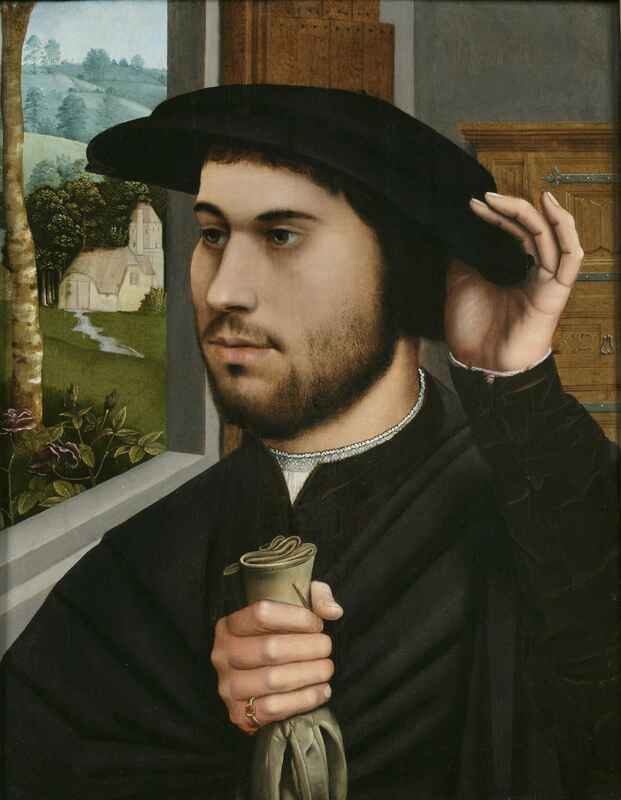 Ambrosius Benson, Portrait of a Man, c. 1530. Huile sur bois. Private Collection. The works in the exhibition are of a sublime aesthetic quality and bear witness to an exceptional craftsmanship on the part of the artists. 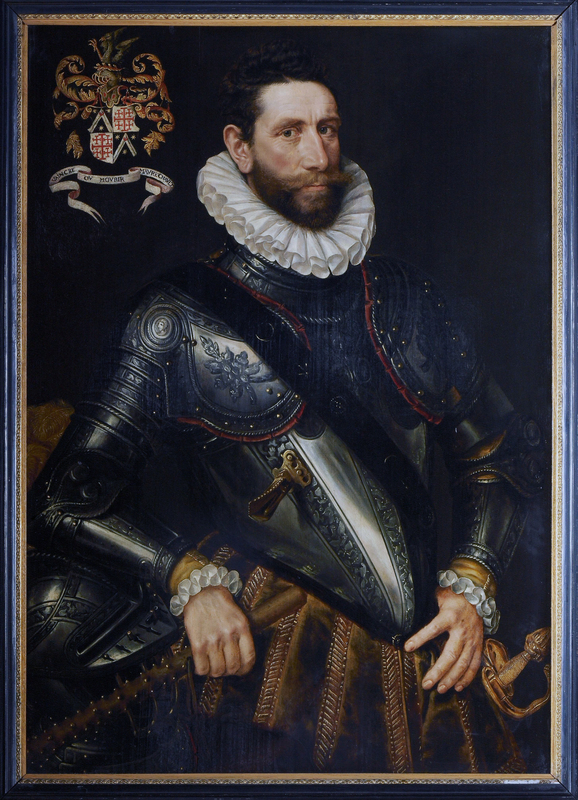 The Low Countries (Antwerp, Bruges, Brussels, Amsterdam, Utrecht, Haarlem…) confirmed their reputation as one of the most important centres of portraiture. 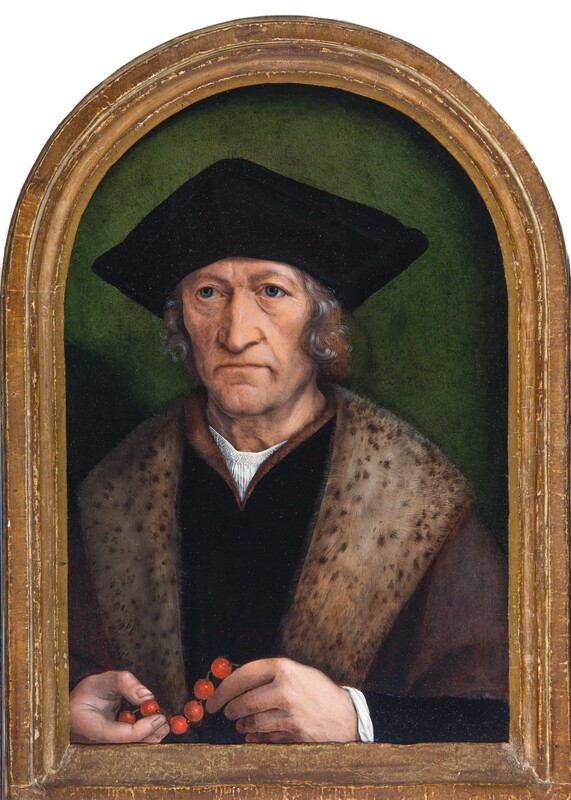 Artists such as Quentin Metsys, Joos van Cleve, Simon Bening, Ambrosius Benson, Joachim Beuckelaer and Catharina van Hemessen immortalised their contemporaries in astonishingly deft and incredibly detailed, almost photorealistic, paintings. 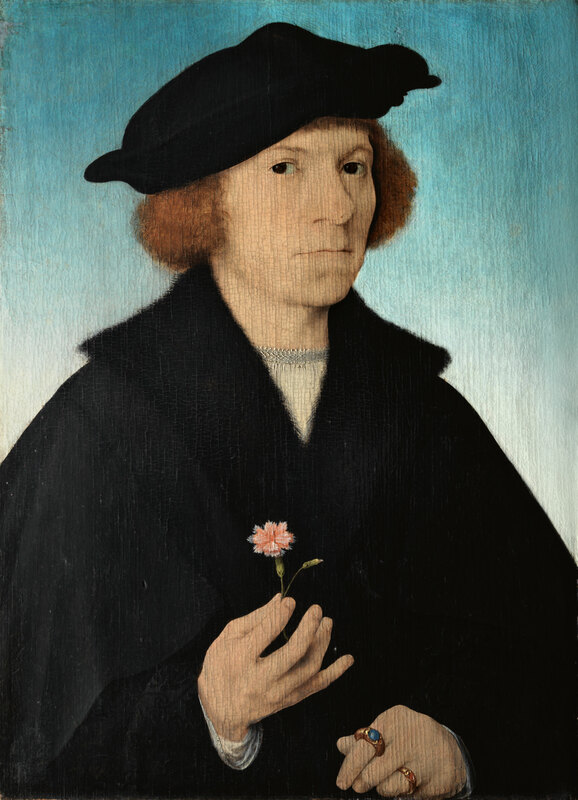 Michel Sittow, Portrait of a Gentleman, c. 1520. Huile sur bois. Private collection, courtesy of Het Noordbrabants Museum, ‘s-Hertogenbosch (The Netherlands). 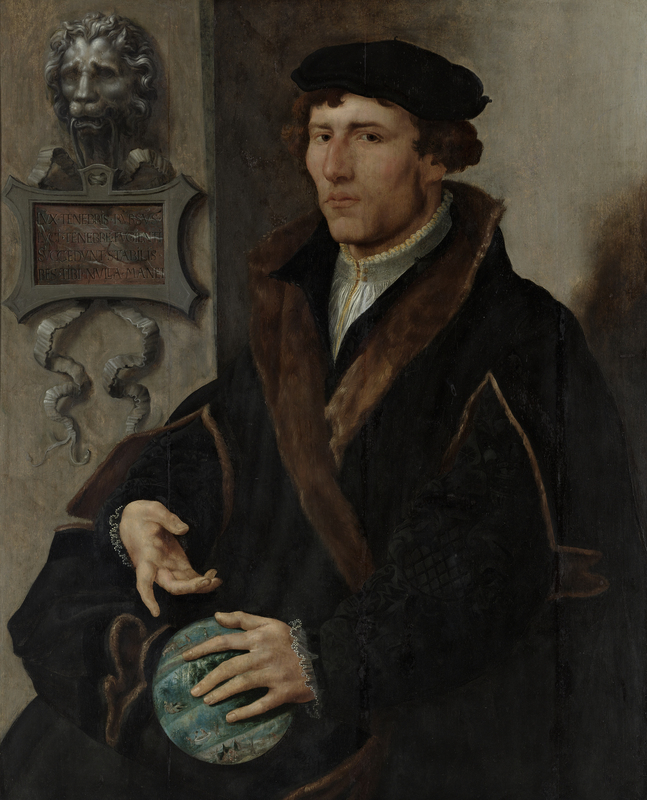 The exhibition includes a few rare loans, such as the Portrait of an Old Woman (Museum of Fine Arts, Caen) by Frans Floris de Vriendt, the Portrait of Jan Van Scorel (Society of Antiquaries) by Anthonis Mor and the Portrait of a Man (Private collection) by Ambrosius Benson. The Self Portrait (Galleria degli Uffizi) by Anthonis Mor is, for example, one of the renowned works of art history. 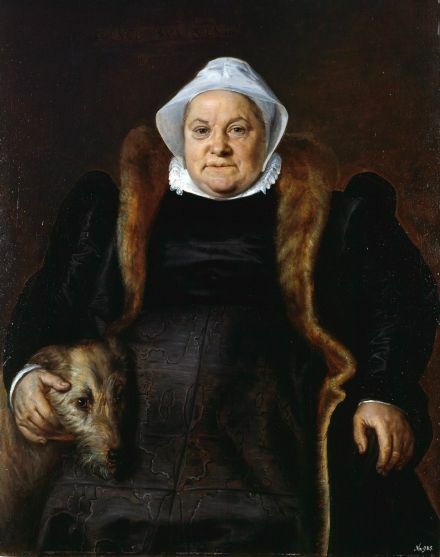 Frans Floris de Vriendt, Portrait d’une vieille dame, 1558, huile sur bois. Musée des Beaux-Arts de Caen. The artists from the Low Countries believed that the visible world was God’s creation and couldn’t be meddled with. As a result they strove for a depiction that was as true to life as possible. By adding small imperfections, such as wrinkles, scars or birthmarks, they tried to get a grip on what makes man an individual. This outlook was diametrically opposed to the beliefs of artists from the Italian Renaissance, such as Botticelli, Michelangelo and Leonardo da Vinci, who tried to idealise the subject of the portrait and sought the universal in mankind. The confrontation between both visions made room for experiment: artists looked for a synthesis between both visions and there was an unseen multiplicity of interpretations of the portrait during this period. Marteen van Heemskerck, Portet van Reinerus Frisius Gemma, c. 1540-1545. Huile sur bois. Museum Boijmans van Beuningen. Striving for the so-called ‘pure reproduction of reality’ was thus doomed to fail. Every work of art is nonetheless an artistic interpretation of reality by the artist. A portrait is in its very essence a construction of the identity of the person portrayed, through the choice of pose, attire, backdrop or attributes. This raises fascinating questions about the relationship between the portrayed and the artist, about how the person portrayed sees himself and about the way he wishes to present himself to the outside world. Attribué à Adriaen Thomasz. Key, Portret van Johan II de Mauregnault, 2ème moitié du 16ème siècle. Huile sur bois. Museum Mayer van der Bergh, Antwerpen. Art historian Till-Holger Borchert, born in Germany and specialised in 14th and 15th century art, has been head curator of the Groeninge Museum and the Arentshuis in Bruges since 2003 and writes authoritatively about the art of the Netherlands. Memling’s Portraits (Bruges / New York, Frick Collection / Madrid, Thyssen-Bornemisza) is one of the most important exhibitions that he has curated. His book Meesterwerk was praised by the Financial Times as one of the best art books of 2014. Joos van Cleve, Selfportrait, c. 1519. Huile sur bois. Museo Thyssen-Bornemisza, Madrid. Koenraad Jonckheere lectures in Northern Baroque Art at the University of Ghent and published about the art market of the 17th and 18th century and about portraiture in 16th century Antwerp. He was curator of the exhibition about Michiel Coxcie in Museum M in Leuven. 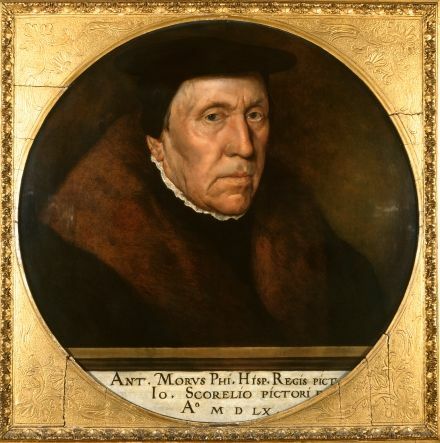 Antonius Mor, Portrait of Jan van Scorel, 1559-1560. Huile sur bois. Society of Antiquaries of London. 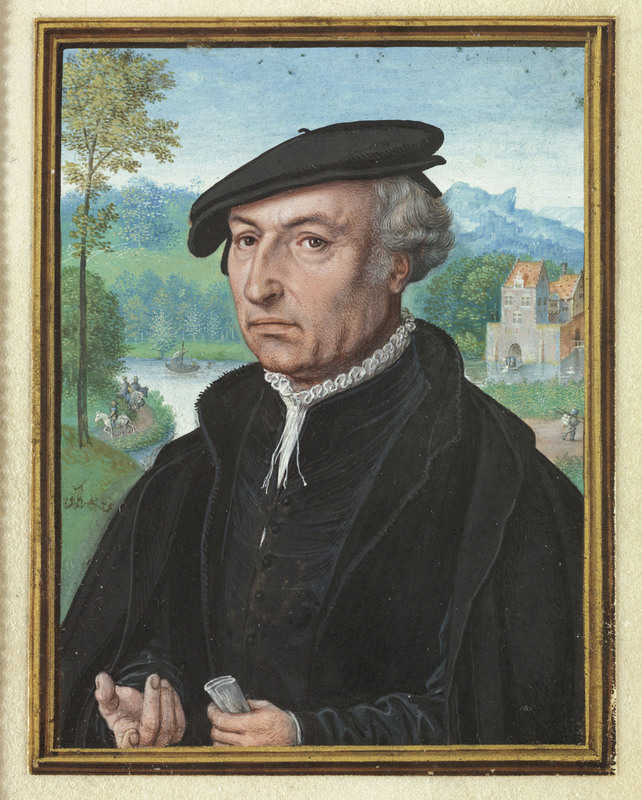 Quinten Metsys, Portret van een Man met rozenkrans, c. 1515-1520. Huile sur bois Private Collection. 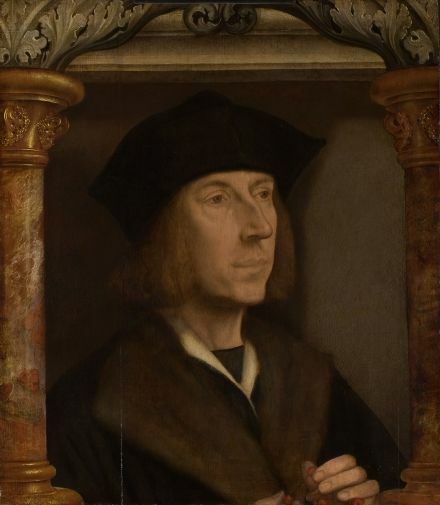 Simon Bening, Selfportrait aged 75, 1558. Aquarelle sur vélin marouflé sur carte. Victoria and Albert Museum, London. 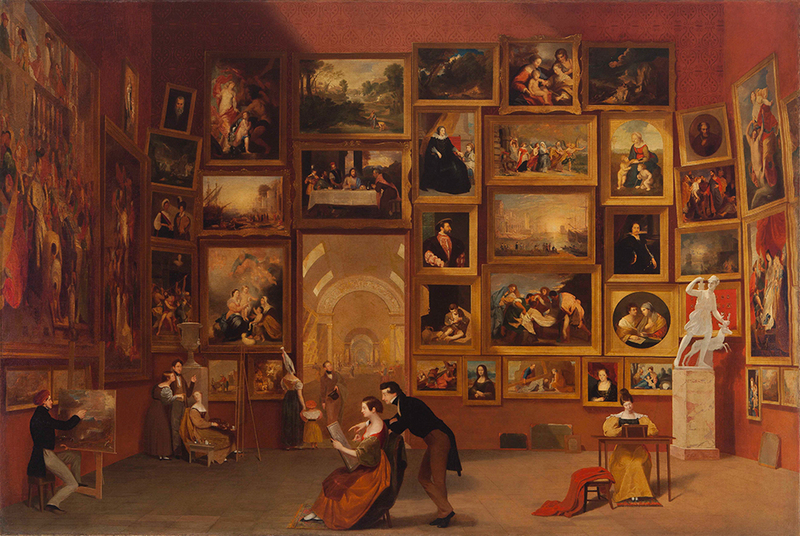 Samuel F. B. Morse (1791–1872), Gallery of the Louvre (1831–33), oil on canvas, 73 1/2 x 108 in. Terra Foundation for American Art, Chicago. SAN MARINO, CA.– Samuel F. B. Morse (1791–1872), of Morse code fame, may be better known as an inventor, but he began his career as a painter, and his extraordinary six-by-nine-foot masterwork, Gallery of the Louvre, is on view at The Huntington Library, Art Collections, and Botanical Gardens Jan. 24 through May 4, 2015. The presentation of the focused exhibition “Samuel F. B. Morse’s Gallery of the Louvre and the Art of Invention” at The Huntington marks the launch of a nine-venue tour of the United States organized by the Terra Foundation for American Art, from whose collection the painting is drawn. Created between 1831 and 1833 in Paris and New York, Gallery of the Louvre reproduces famous works by van Dyck, Leonardo, Murillo, Poussin, Rembrandt, Rubens, and Titian, among others, arranged in an imagined installation in the Salon Carré at the Musée du Louvre in Paris. Morse depicted 38 paintings, two sculptures, and numerous figures in a single composition. The monumental canvas has been seen as a painted treatise on artistic practice, positioning Morse (the centrally placed instructor in the work) as a symbolic link between European art of the past and America’s cultural future. After enjoying some success in London, Morse returned to the U.S. in 1815 and soon married and began a family. In 1822, he painted a precursor to Gallery of the Louvre, the seven-by-ten foot House of Representatives (now in the collection of the Corcoran Gallery of Art, Washington, D.C.), for which he had to compile nearly 100 portraits of congressmen, delegates and other figures. It was during a trip to Paris in September 1831 that Morse had the idea to craft another large-scale painting, this one of the Salon Carré in the Louvre, with carefully selected and arranged works from the Louvre’s collection. At the time, Morse was the founding president and professor of painting at the National Academy of Design in New York, and his interest in painting Gallery of the Louvre was clearly pedagogical. He hoped to bring back to Americans a teaching canvas depicting what he considered the major works of Europe. The project required numerous calculations to scale and arrange the works, as well as the use of a camera obscura or similar pre-photographic optical device. Working furiously, Morse raced to finish the painting before the Louvre’s annual closure in August. He then rolled the canvas for travel and did not unroll it again until early 1833, back home on American soil, where he added finishing touches to the painting. Gallery of the Louvre debuted publicly in Manhattan in the fall of 1833, along with a publication that included a description of the Louvre’s collections, a summary of the project, and an annotated key to the painting. Though it was displayed at a time when single-painting exhibitions were in vogue, and though the painting drew praise from critics and connoisseurs, it failed to attract a popular audience. Morse’s development of the single-wire telegraph and Morse code began around the time of his disappointing Gallery of the Louvre exhibit, and he never again returned to painting. In 2010, the Terra Foundation oversaw a six-month conservation treatment of Gallery of the Louvre that repaired damages that had occurred over time and yielded insight into Morse’s working methods. The painting’s conservation was documented in a 30-minute video produced by Sandpail Productions for the Terra Foundation. A shorter, six-minute version of the video is being shown in the exhibition at The Huntington. From 2011 to 2013, Gallery of the Louvre was exhibited at the Yale University Art Gallery, the National Gallery of Art, and the Pennsylvania Academy of the Fine Arts, where it was the subject of scholarly investigation and dialogue. The new research generated from this analysis culminated in the exhibition “Samuel F. B. Morse’s Gallery of the Louvre and the Art of Invention,” as well as a book of the same title. Published by the Terra Foundation and distributed by Yale University Press, the book assembles a dozen essays by academics, curators, and conservators who focus on the painting’s visual components and its social and historical contexts. The exhibition’s presentation at The Huntington has been augmented by rare Morse-related historical materials from The Huntington’s library collections, including rare printed materials and unique manuscripts. In addition to the video, the installation includes an interactive opportunity for visitors to curate their own virtual gallery with miniature versions of highlights from The Huntington’s art collections. Raphael, Small Cowper Madonna, 1505. 60 cm x 44 cm. WORCESTER, MASS.- The loan of Raphael’s Small Cowper Madonna from Washington’s National Gallery of Art from January 24 through September 27, 2015, provides a rare opportunity to study our own Northbrook Madonna and perhaps uncover the mystery of who painted it. Here Jon L. Seydl, director of curatorial affairs and curator of European Art interviews Raphael scholar Linda Wolk-Simon about the two works. JLS: While I think everyone would agree that Raphael’s painting is incredibly beautiful, it might not be so obvious why this painting is so significant. What makes this painting so interesting and important? LW-S: Raphael’s Small Cowper Madonna is striking for the way he endows a sacred subject with the gloss of reality. Portrayed as though they are ordinary beings, the holy figures share a tender, touching intimacy that makes them seem convincingly human: at first glimpse this appears to be a lovely young mother, lost in wistful reverie, holding a plump baby who clamors to stand in her lap. Adding to the impression that this is a believable, if idealized, tableau is the atmospheric landscape with gently rolling hills and graceful trees, bathed in a warm, enveloping light, that recedes into the distance. Rising on a hillock at the right is a handsome Renaissance church, San Bernardino, the burial place of the dukes of Urbino. This telling topographical detail indicates that Raphael must have painted the picture for someone in his native city rather than for a patron in Florence, where he worked for much of the time during the period when this work was created. The church is also a clue that, for all its engaging naturalism, this is a devotional image with a religious meaning. Conveyed in the Madonna’s expression of sad resignation is her foreknowledge of the future Passion and death that her infant son, Redeemer of mankind, will suffer. JLS: The painting is known as The Small Cowper Madonna, something that would probably be very surprising to Raphael. Can you talk about why we use this name for the painting? JLS: You’ve spent some time studying Worcester’s painting, which was once attributed to Raphael, and is now given to a much more open-ended Master of the Northbrook Madonna. What do you hope to learn from seeing WAM’s picture next to the National Gallery’s painting? To what should our visitors pay special attention when they compare the paintings? 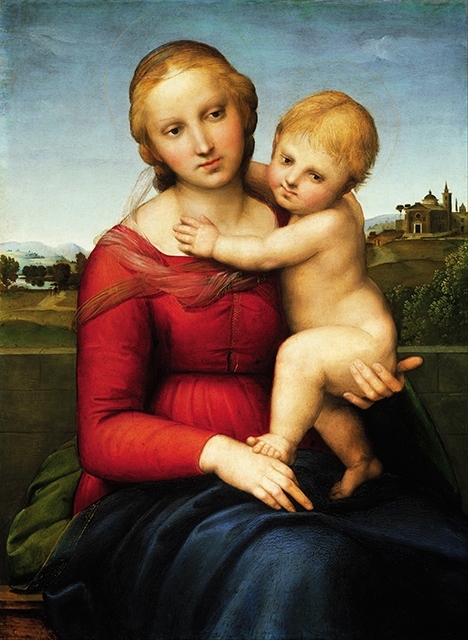 LW-S: Some early scholars believed that the Northbrook Madonna was wholly or in part Raphael, a view that has not been upheld in more recent literature devoted to the artist. New information on the underdrawing beneath the paint layer of the Northbrook Madonna that modern, non-invasive technology allows us to see—hidden evidence that can be compared with the extensive underdrawing of the Small Cowper Madonna–will be of prime importance to this investigation of the Worcester Madonna’s authorship. Technical imaging aside, viewers should look closely and comparatively at the details—the typologies of the faces of the Madonna and Child, the complexity of their poses and the rhythm of the overall compositions, the facility with which form and volume are rendered and light and landscape described, the sense of emotional or psychological connection between the figures—or its lack—and ask themselves if they see the same confident mind and hand operating in both. We might also ponder whether Raphael could have designed the Worcester Art Museum’s picture but allowed someone else to paint part or all of it. If it’s not by Raphael, as scholars today maintain, we need to ask who among his close associates and artistic collaborators around the year 1505 might have executed this most Raphaelesque of works. Linda Wolk-Simon, Ph.D., is an independent scholar and freelance curator specializing in 16th-18th century Italian art, with a particular focus on paintings and drawings by Raphael and the members of his workshop. She was a curator at The Metropolitan Museum of Art for over 20 years, and more recently was Curator and Head of the Department of Drawings and Prints at the Morgan Library & Museum. She has published numerous essays and exhibition catalogues as well as articles and reviews in such journals as Apollo, Art Bulletin, Burlington Magazine, Master Drawings and Renaissance Quarterly. Her 2006 publication, Raphael at the Metropolitan: The Colonna Altarpiece, published by Yale University Press, was awarded “Outstanding Essay Focused on a Single Work of Art” by the Association of Art Museum Curators. Recent projects include an essay on the 16th-century Florentine sculptor Baccio Bandinelli for the catalogue of an exhibition of Italian Renaissance Sculptors’ Drawings at the Isabella Stewart Gardner Museum in Boston (October 2014-January 2015) and the lead essay in a catalogue devoted to Raphael’s portrait of a young woman with a unicorn in the Borghese Gallery, Rome, for an exhibition in San Francisco and Cincinnati in 2015.
dedicated to the Kano painters, the most enduring and infuential school of Japanese painting. Established in the 15th century, the Kano created and upheld standards of artistic excellence in Japan for nearly four hundred years. It developed against the backdrop of one of the greatest periods in Japanese history. Ink and Gold: Art of the Kano will focus on the artistic dynasty’s leading fgures and will be drawn largely from Japanese imperial, national, and private collections, including those of such celebrated cultural landmarks as Nijō-jō and Nagoya castles. 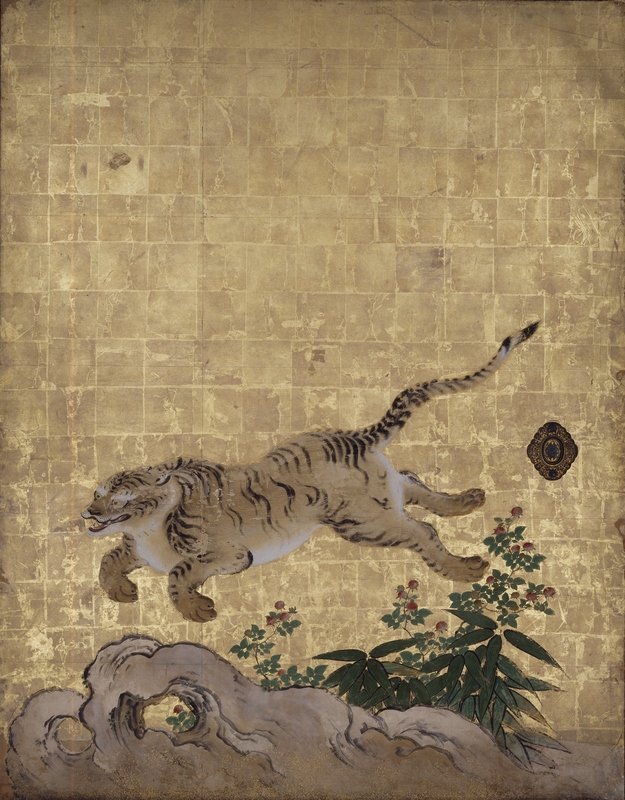 The exhibition will feature rare and magnifcent works—many distinguished by their stunning use of gold leaf—that are considered treasures in Japan for their high cultural importance and rarity. The exhibition will be seen only in Philadelphia. The Kano School was signifcant both for its longevity and for the achievements of some its most illustrious members, such as its founder, Kano Masanobu (1434–1530), and Kano Tan’yū (1602–1674). It also became an academy, with rigorous training in workshops that fostered the development and preservation of painting traditions. The Kano School arose and then prospered under unique circumstances, frst in Kyoto and then in Edo (present-day Tokyo), with the patronage of Japan’s military and political elite. With the waning of their power and the opening of Japan to cultural infuences from abroad in the late nineteenth century, the preeminent role of the Kano School in Japanese art came to an end. The last exhibition to be devoted to the entire history of the Kano School was seen in 1979 in Tokyo. In Philadelphia, due to their light sensitivity, the works in Ink and Gold will be presented in three rotations, offering multiple opportunities to experience the full depth, scope, and variety of the Kano painters’ remarkable achievements. exceptionally rare paintings of Masanobu, who specialized in ink landscapes distinctive for their craggy hills and distant vistas inspired by China, which deeply informed Japanese culture. Among these is a National Treasure, a hanging scroll depicting a famous scholar admiring lotuses in a mist-flled scene. 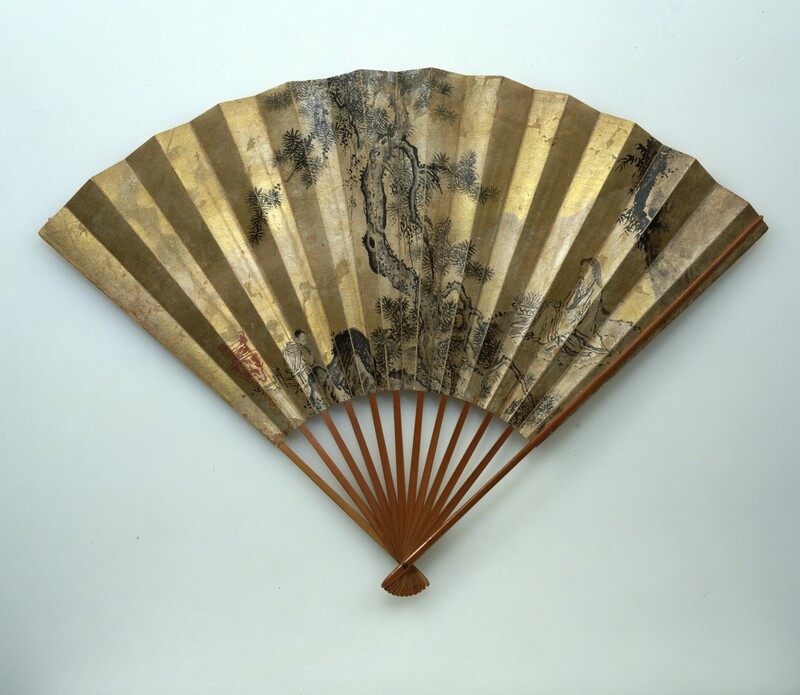 Sets of folding fans made for privileged women or visiting emissaries are also on view. Panoramas of farming across the seasons abound in the exhibition, refecting an enduring theme based on Confucian ideas that prosperous agriculture results from good government. 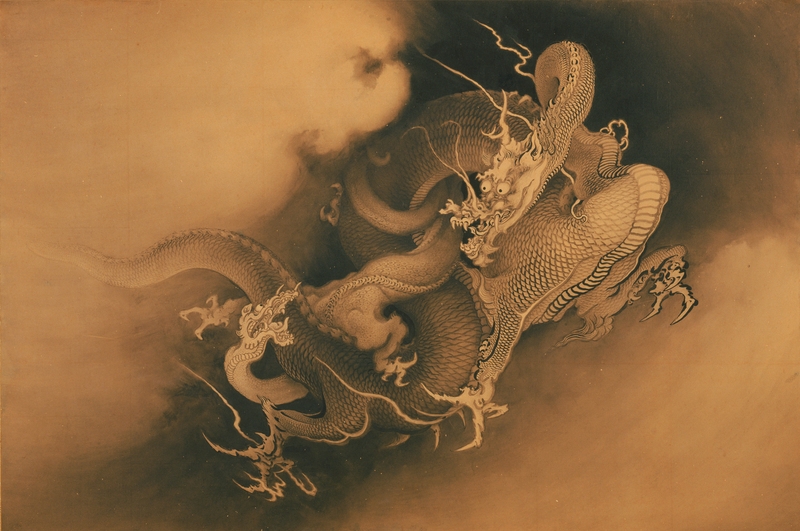 Among the highlights of the exhibition are works by Tan’yū. A contemporary of Rembrandt van Rijn, he is among the most admired of all Japanese artists, and was the frst Kano painter ordered by the military to open a studio in Edo. His work refects a striking range of accomplishments. His ink landscapes and scenes of waves breaking in vast seas are rendered with a virtuoso brush. Traveling between Kyoto and Edo (now Tokyo), Tan’yū frequently passed Mount Fuji. He was the frst to paint it in a horizontal hanging scroll format, establishing the now familiar convention through which the mountain became a national symbol for the country. Many of the most dazzling works in the exhibition are those created for public display, especially the large-scale folding screens and sliding doors designed for the residences of Japan’s elite in the 16th and 17th centuries, with oversized fgures and landscapes. These include Tan’yū’s Eagle and Pine Tree (Nijō-jō Castle), Wasteful Payment for an Observation Tower (Nagoya Castle), and scenes of tigers prowling amid bamboo and images from The Tale of Genji. 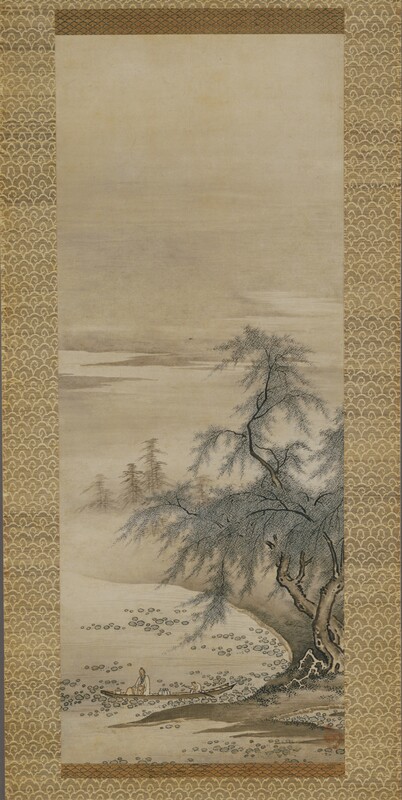 While Tan’yū served the elites of both Kyoto and Edo, artists such as Eigaku (1790–1867) remained close to the culture of Kyoto, rendering courtly subjects on folding screens celebrating music, dance, and poetry, and exulting in nature with paintings of trees and exotic birds. Other Kano artists were also closely associated with Edo. Seisen’in Osanobu (1796–1846) created an elaborate decorative scheme for Edo Castle and other images ranging from Mount Fuji to falconry. His work for the castle was ultimately destroyed by fre, but it is represented in the exhibition through rare surviving sketches. The exhibition is organized by the Philadelphia Museum of Art and co-organized by the Agency for Cultural Affairs of Japan with the special co-operation of the Tokyo National Museum. A Highland Landscape with a Game of Shinty, attributed to the artists Daniel Cunliffe and A.Smith of Mauchline. Last seen in 1962, the painting disappeared from public view for over fifty years. EDINBURGH.- The painting A Highland Landscape with a Game of Shinty is the most famous depiction of the world-celebrated Scottish sport and one of the treasures of the game. Last seen in 1962, the painting disappeared from public view for over fifty years, although it has frequently been used in books and articles to highlight the provenance of the game. After a three-year search triggered by the Playing for Scotland exhibition at the Scottish National Portrait Gallery , the picture was eventually uncovered in a private collection belonging to a descendent of the last-known owner. 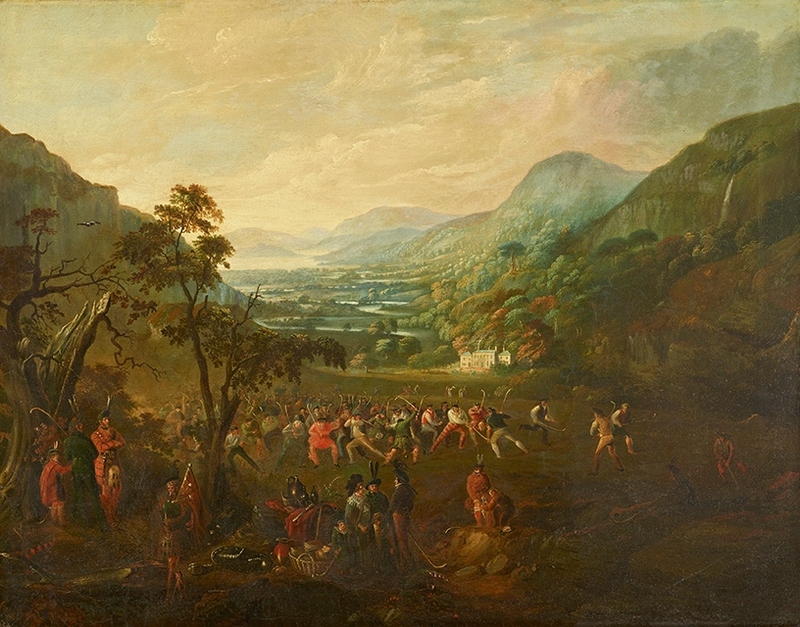 A Highland Landscape with a Game of Shinty, attributed to the artists Daniel Cunliffe and A.Smith of Mauchline, is now on long-term loan to the Galleries and will join the many other works in Playing for Scotland, which explores the rich history of Scottish sporting traditions. To celebrate the painting going on public display for the first time in half a century, shinty’s greatest ever goal-scorer Ronald Ross, MBE and the sport’s noted BBC commentator and historian Dr Hugh Dan MacLennan will be at the Scottish National Portrait Gallery for a press call, with the premier prize in shinty: the Scottish Hydro Camanachd Cup. The only man to have scored more than 1000 goals in the sport, Ross has earned the eponym ‘Ronaldo of the Glens’, after the Brazilian footballer. He recently announced his retirement from active play for Kingussie Camanachd, officially the world’s most successful sporting team of all time, according to the Guinness Book of Records. Ross recently crowned a stellar career with a man-of-the-match performance as led Kingussie lifted the Camanachd Cup in 2014 for the twenty-third time. The game depicted in the painting quite possibly took place on the Cluny estate near Newtonmore. Sticks (camans) are raised in frenzied action; the presence of pipers, dancers and refreshments implies this match is a festival game, perhaps enjoyed at New Year. The Badenoch and Strathspey Shinty Heritage Project believe the scene almost certainly depicts one of the famous shinty ball-plays organised by Cluny Macpherson, Chief of Clan Chattan. The setting and painting are probably the source of many depictions of shinty which followed from the mid-nineteenth century. Shinty has been described as the oldest-known Celtic sport. The Camanachd Association (CA) was founded in 1893 to lead the development of the game by ensuring there was one set of rules and a framework for organising competitions nationally. Currently based in Inverness, the CA remains the governing body for shinty across the world. Jim Barr, President of the Camanachd Association said: “The Camanachd Association is delighted that the iconic painting A Highland Landscape with a Game of Shinty has been located, and will be on display at the Scottish National Portrait Gallery. We would like to thank the owner of the painting and the National Galleries of Scotland for displaying one of Scotland’s most iconic and most important sporting paintings. The scene very much embodies the spirit of the game, which is still played in some of the most attractive settings in the world”. Commenting on this new long-term loan, Christopher Baker, Director of the Scottish National Portrait Gallery, said: “After a three-year search, I’m delighted that A Highland Landscape with a Game of Shinty is now on long-term loan to the Scottish National Portrait Gallery and will be on display in Playing for Scotland. Our visitors can enjoy it amid many iconic artworks, brought together for the first time, which depict the nation’s sports”. 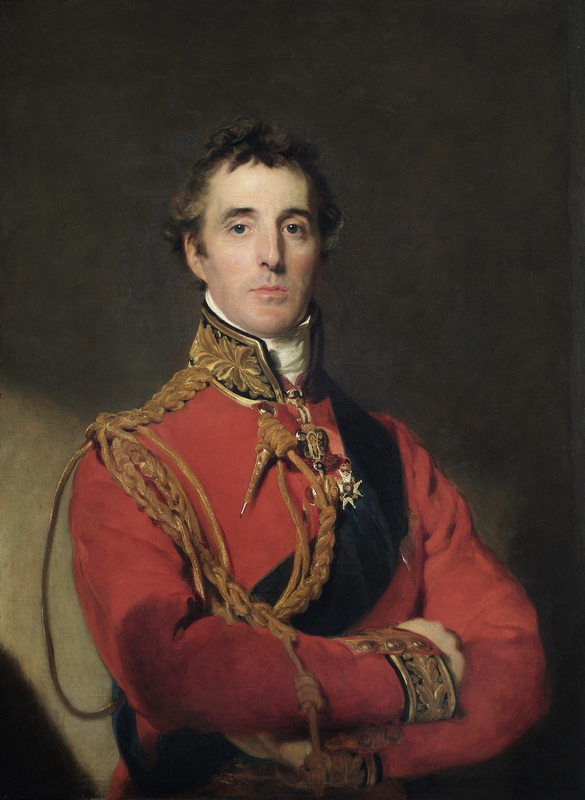 Arthur Wellesley, 1st Duke of Wellington by Sir Thomas Lawrence, 1815-16. ©Wellington Collection, Apsley House, London (English Heritage). LONDON.- The first gallery exhibition devoted to the Duke of Wellington will open at the National Portrait Gallery, to mark the 200th anniversary year of the Battle of Waterloo in 2015, it was announced today (Wednesday 29 October 2014). 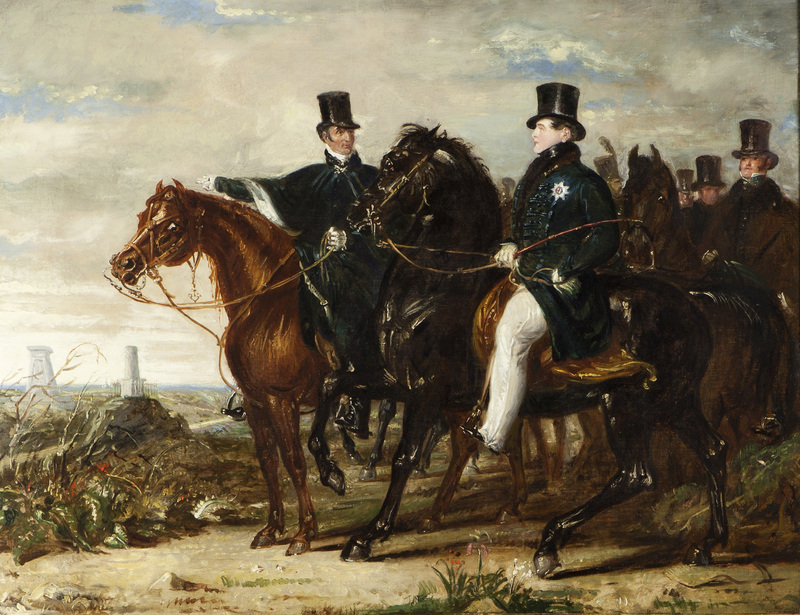 Wellington: Triumphs, Politics and Passions (12 Mar-7 Jun 2015) will explore not only the political and military career of the victor of this great battle – but also his personal life through portraits of his family and friends. 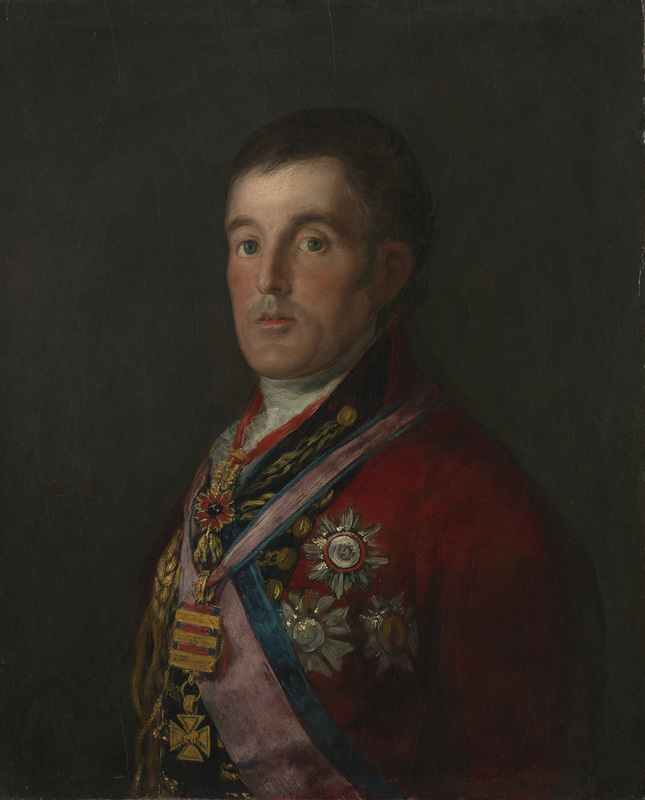 Highlights include Goya’s portrait of Wellington started in 1812 after his entry into Madrid and later modified twice to recognise further battle honours and awards; and from Wellington’s London home, Apsley House, Thomas Lawrence’s famous 1815 portrait painted in the same year as the Battle of Waterloo. This iconic military image of Wellington was used as the basis of the design of the British five pound note from 1971 to 1991. Drawn from museums and private collections including that of the present Duke of Wellington, the exhibition of 59 portraits and other art works has the support of the Marquess of Douro, and includes rarely-seen loans from the family including a portrait by John Hoppner of the Duke as a youthful soldier and a daguerreotype portrait by Antoine Claudet, in the new medium of photography, taken on Wellington’s 75th birthday in 1844. 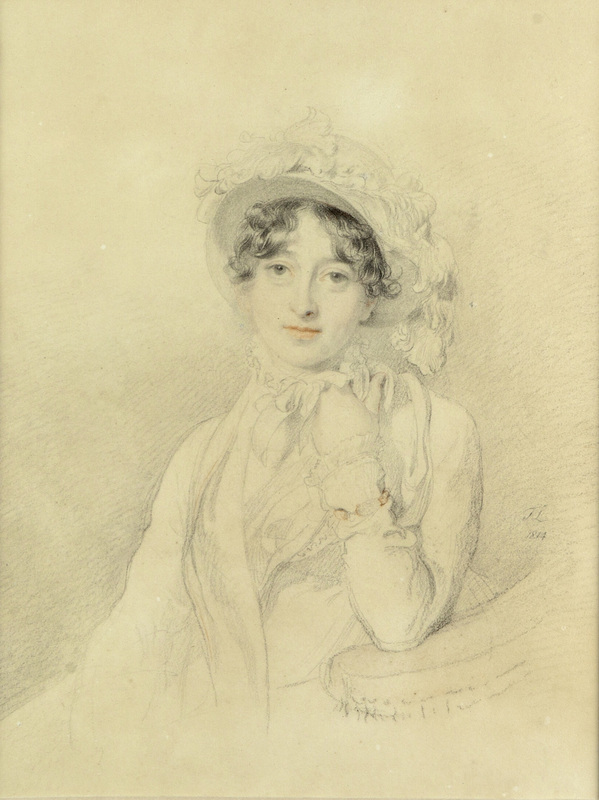 The family has also loaned Thomas Lawrence’s beautiful drawing of Wellington’s wife, Kitty (née Pakenham). The real experience of soldiers fighting in Wellington’s armies will be explored through eyewitness accounts, including prints based on sketches by serving soldiers and the illustrated diary of a young officer, Edmund Wheatley written, in a lively style, with the intention of it being read by his sweetheart. Wellington: Triumphs, Politics and Passions considers the attempts of the art world to celebrate the Duke of Wellington’s military successes. Commemorative objects on display will range from royal commissions by Europe’s foremost artists and manufacturers to more modest souvenirs aimed at the domestic market. Wellington’s eventful and often difficult political career will be illustrated by examples of the many satirical prints published in the 1820s and 1830s and the exhibition will also examine the reappraisal of Wellington’s life that took place at his death and on the occasion of his lavish state funeral. The Duke of Wellington’s long life (1769 –1852) spanned the eighteenth and nineteenth centuries. Most famous for his victory over Napoleon at the battle of Waterloo, he later entered politics, serving twice as Prime Minister. Wellington: Triumphs, Politics and Passions will explore the role of visual culture in creating the hero, the legacy of heroism and the role of the portrait in Wellington’s own public and personal self-representation. Curated by Paul Cox, Associate Curator, National Portrait Gallery, with close support from Dr Lucy Peltz, Curator of Eighteenth-Century Portraits, National Portrait Gallery, this biographical exhibition will use portraits and objects to explore Wellington’s military career and his sometimes controversial political and personal life. 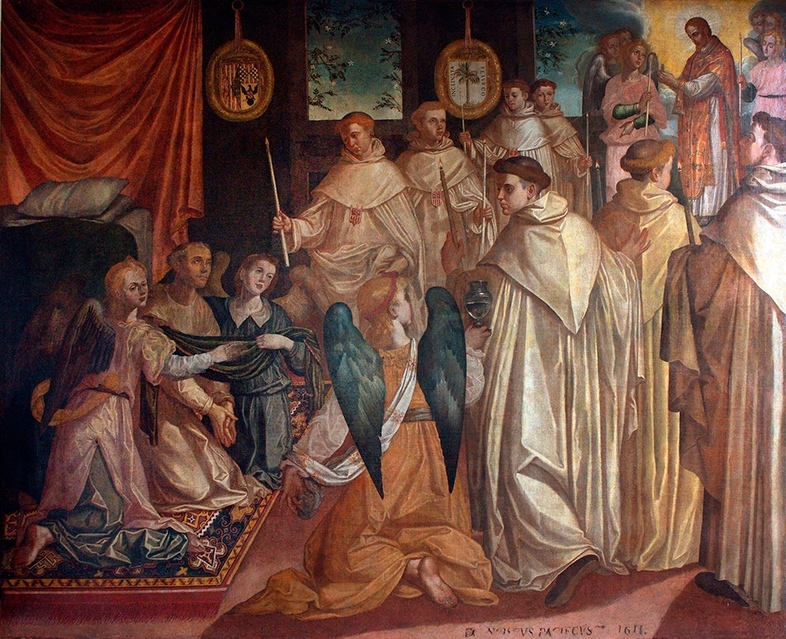 Francisco Pacheco (1564-1654), The Last Communion of Saint Peter Nolasco, 1611. Oil on canvas. The Bowes Museum. 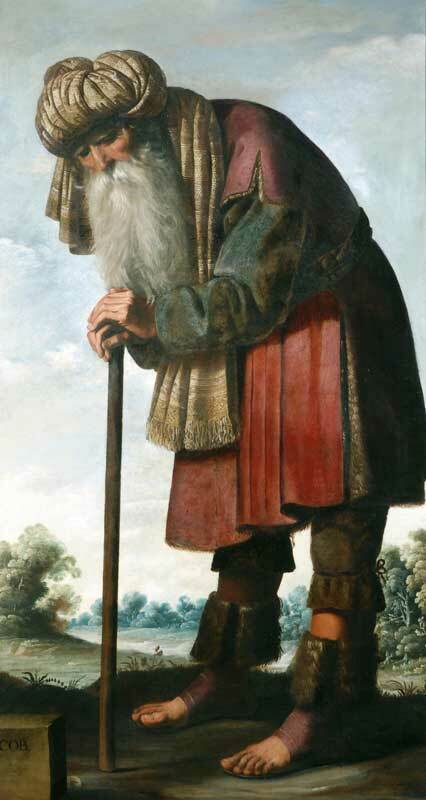 COUNTY DURHAM.- The Last Communion of Saint Raymond Nonnatus forms the centrepiece of the show, Six Masterpieces, which includes significant loans from the Museo del Prado in Madrid and the National Gallery in London. The exhibition investigates the painting’s creator, Francisco Pacheco (1564-1654) and the Sevillian School of painting, exploring his role as the master of the second generation of painters in Seville during that period. 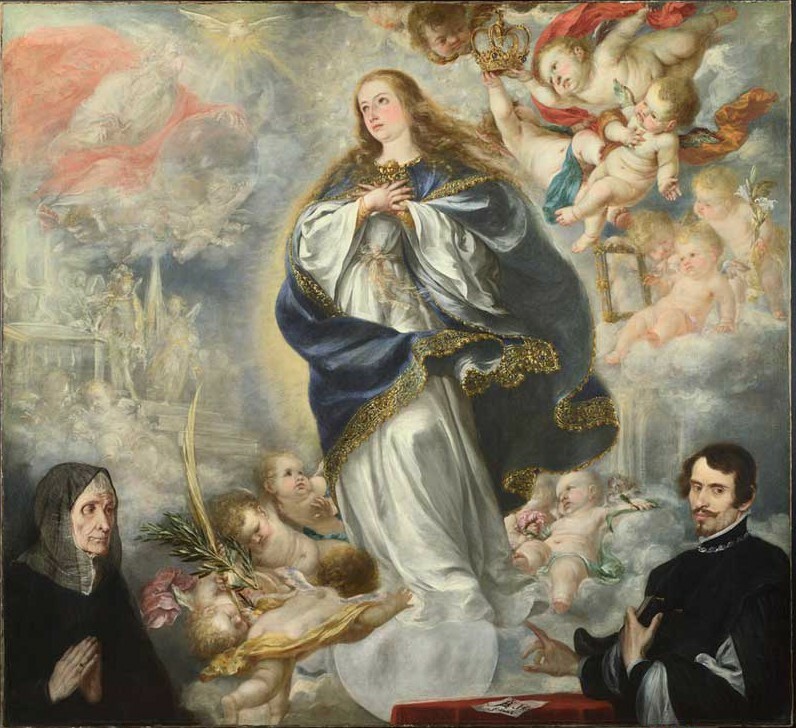 The painting is one of six executed by Pacheco for the Merced Calzada Convent in Seville, now the Museo de Bellas Artes. It is a work of great significance to the history of Spanish painting, an area in which The Bowes Museum excels; its collection boasts 76 works by Spanish artists, making it the finest venue in the UK to explore the genre after the National Gallery. Pacheco was author of a critical treatise on the theories and practises of painting, Arte de la Pintura, which was fundamental to the development of Spanish Baroque painting. He was an important figure, both in the scope of his interests and teachings and as master and father-in-law of Diego Velázquez. The painting follows the techniques of his treatise, with chemical analysis proving that the ground colour came from silt from the Guadaquivir River which flows through Seville. It was donated to The Bowes Museum in 1964 in memory of Tony Ellis, the Museum’s former Deputy Director, and now, following a lengthy period of restoration, it takes star billing in the exhibition which is on view until 1 February. “It was in storage from the 1960s to the 1990s, but in the early 70s a thick coat of varnish was applied to stabilise the paint; an accepted practice in those days,” said the Museum’s Conservation Manager, Jon Old. Later, after consulting with other restorers, the Museum’s then paintings’ conservator felt the painting could be successfully restored and he set about cleaning it. Following his untimely death in 2004 various conservators, including Jon, continued the work, while a special relationship with the National Gallery saw it lined and cleaned there before the job of reconstructing the badly worn areas could be tackled back at the Museum. David Everingham then took up the mantle, eventually going freelance to concentrate on the mammoth project in his Yorkshire studio. Femme (“Demoiselles d’Avignon” period) 1907, Pablo Picasso. Oil on canvas, 119 x 93.5 cm. © 2014 Estate of Pablo Picasso / Artists Rights Society (ARS), New York. LOS ANGELES, CA.– Pablo Picasso’s 1907 painting Femme is on temporary display at the J. Paul Getty Museum through March 2015. The painting, which closely relates to Picasso’s famed Les Demoiselles d’Avignon (1907, Museum of Modern Art, New York), will hang in the Getty Museum’s West Pavilion alongside portraits by Edouard Manet and Paul Cézanne, 19th-century masters whom Picasso greatly admired. Femme was created while Picasso was working on his masterwork Les Demoiselles d’Avignon, a notorious brothel scene that stands out as a radical break from his earlier blue and rose periods. 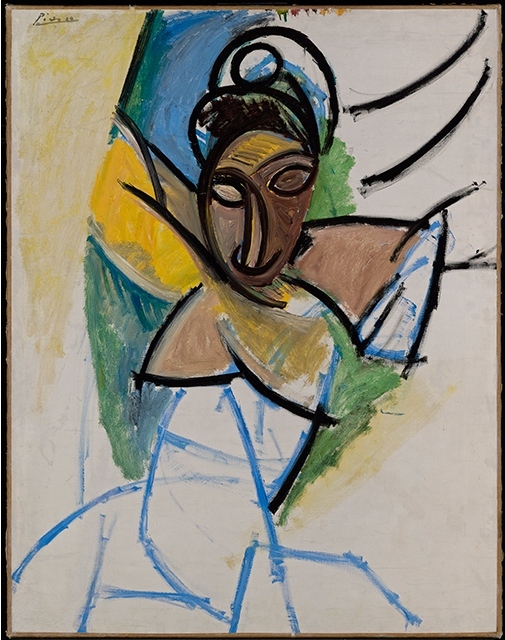 In this painting, Picasso’s burgeoning interest in compressed divided space and African masks is fully evident. Femme is part of the collection of the Beyeler Foundation in Basel, Switzerland and was brought to the Getty by their chief conservator, Markus Gross, who spent three months doing research related to the painting, working with Getty Museum conservators and Getty Conservation Institute scientists, to develop a conservation protocol for the work. When the painting returns to the Beyeler Foundation in Switzerland, Gross and his team will use the conservation protocols developed at the Getty to guide future work on the painting. While at the Getty, Femme was extensively studied using x-radiography, ultraviolet light, and multi-spectral imaging, among other techniques. The J. Paul Getty Museum’s Paintings Conservation Department has a long-established program of bringing important paintings from around the world for conservation, study, and display at the Museum. Scientists from the Getty Conservation Institute—which works to advance conservation practice through research, education, applied field work, and the dissemination of knowledge—were consulted extensively on this project. The Getty Research Institute, which holds one of the world’s most important archives for the study of modern and contemporary art, was also an important resource. 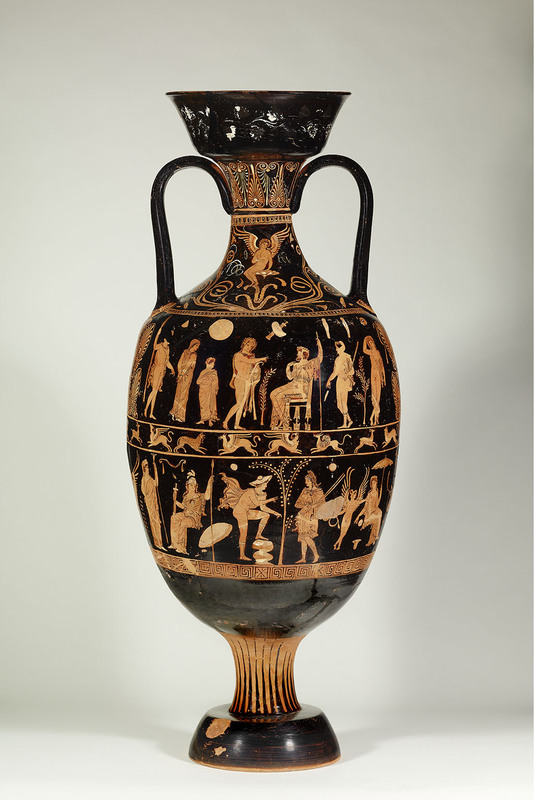 LOS ANGELES – Discovered at Ceglie del Campo, near Bari in Apulia (southeastern Italy), thirteen elaborately decorated Apulian vases will return to display for the first time following a six-year collaborative conservation project between the Getty Villa and the Antikensammlung in Berlin. 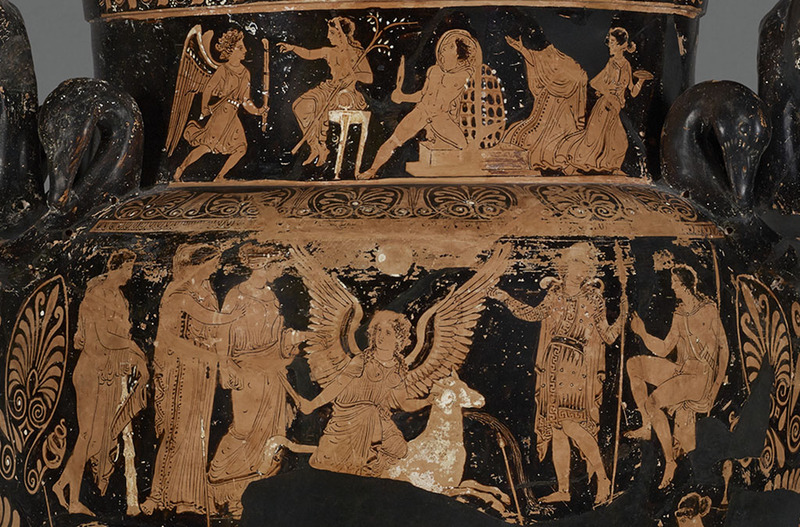 Dangerous Perfection: Funerary Vases from Southern Italy, on view at the Getty Villa November 19, 2014 to May 11, 2015, examines the funerary customs of people native to southern Italy and the ways they used Greek myth to comprehend death and the afterlife. 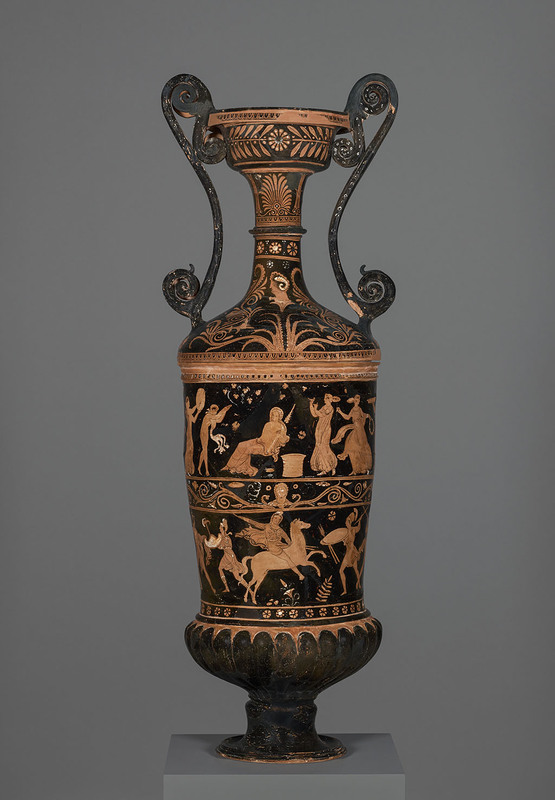 The exhibition also reveals the techniques employed by one of the expert vase-restorers of early nineteenth-century Naples. Funerary Vessel (detail), South Italian, from Apulia, about 350 B.C., terracotta red-figured volute krater associated with the Iliupersis Painter. Image © Staatliche Museen zu Berlin, Antikensammlung. Photo: Johannes Laurentius. Funerary Vessel, South Italian, from Apulia, about 350 B.C., terracotta red-figured hydria attributed to the Chamay Painter. Image © Staatliche Museen zu Berlin, Antikensammlung. Photo: Johannes Laurentius. Ceglie del Campo, where the thirteen funerary vases were found, was a substantial settlement in Apulia populated by the Peucetians, one of the region’s indigenous tribes. 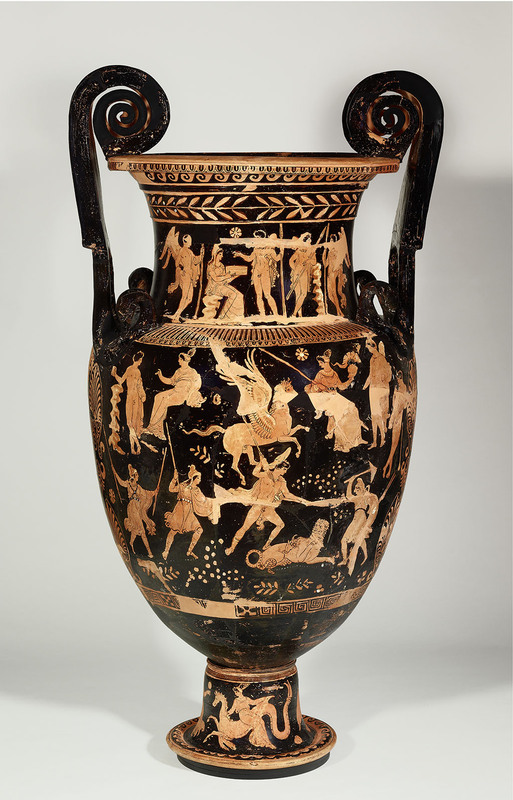 By the fourth century B.C., their close engagement with Greek culture is evident in the red- figured pottery deposited in large quantity in their tombs. Vessels created for rich graves could reach massive proportions and were used primarily for display during burial rites. They show elaborate decorations that were often tailored to their funerary context. 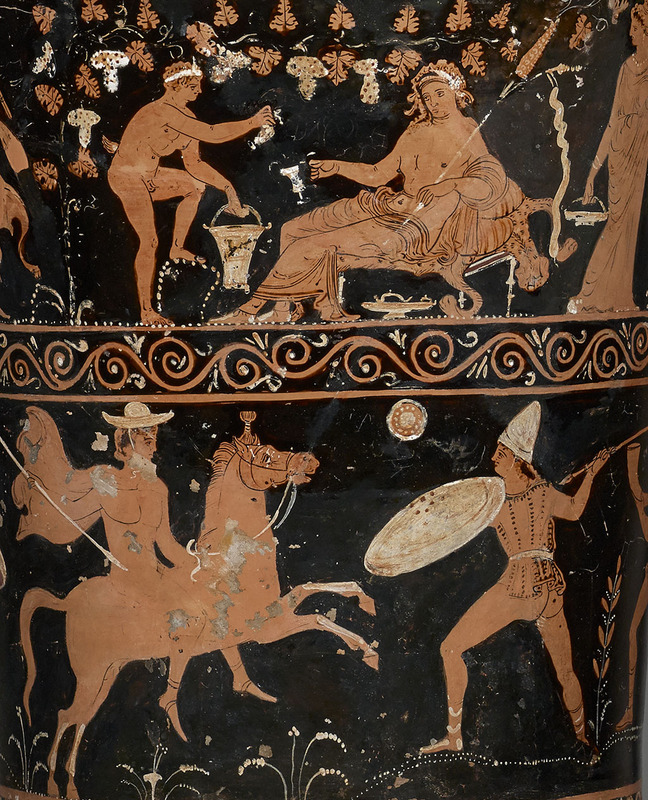 Mythological scenes, which required knowledge of Greek stories and texts, provided consolation that even the great heroes suffered, and that it was possible to prevail over the most frightening of terrors. 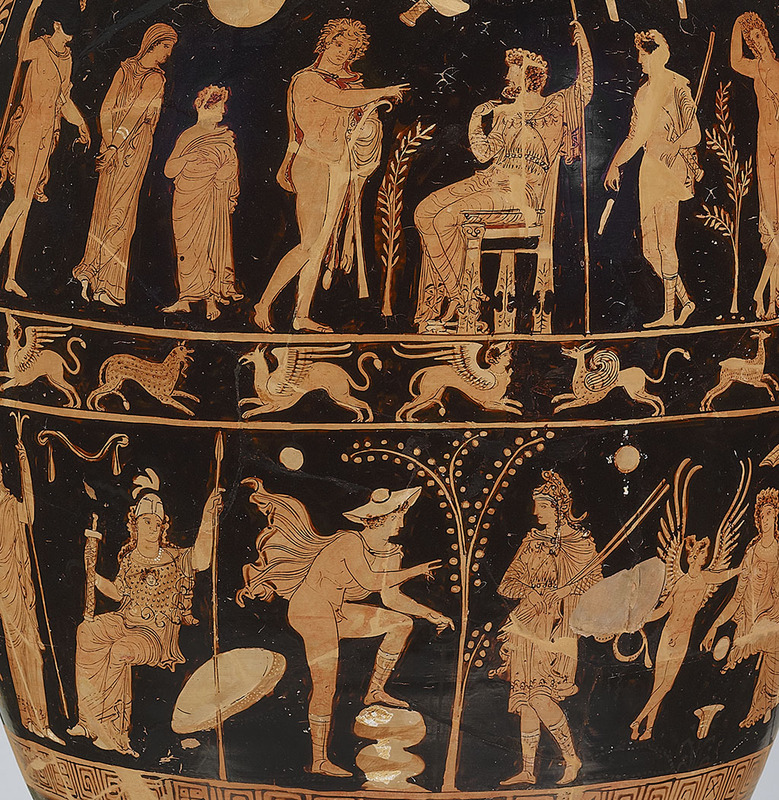 Numerous vases also depict images of Dionysos and his entourage enjoying wine and leisure, suggesting the conception of an afterlife free from mortal concerns. Funerary Vessel, South Italian, from Apulia, 350-325 B.C., terracotta red-figured amphora attributed to the Darius Painter (the Hecuba Sub-Group). Image © Staatliche Museen zu Berlin, Antikensammlung. Photo: Johannes Laurentius. The exhibition reveals some of the methods that were used to attain this level of perfection, and the challenges posed to conservators today. 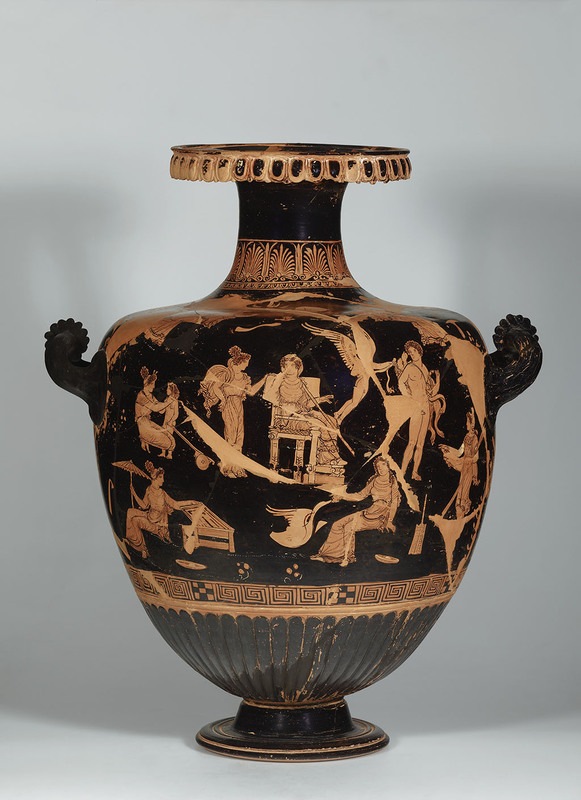 During the six-year collaborative project between the Getty Villa and the Antikensammlung, a variety of techniques were employed to illuminate the vessels’ history and inform the manner of treatment, which involved their disassembly, cleaning, and reconstruction. Funerary Vessel (detail), South Italian, from Apulia, 350-325 B.C., terracotta red-figured amphora attributed to the Darius Painter (the Hecuba Sub-Group). Image © Staatliche Museen zu Berlin, Antikensammlung. Photo: Johannes Laurentius. “The opportunity to work with our colleagues in Berlin on this project has been immensely productive. 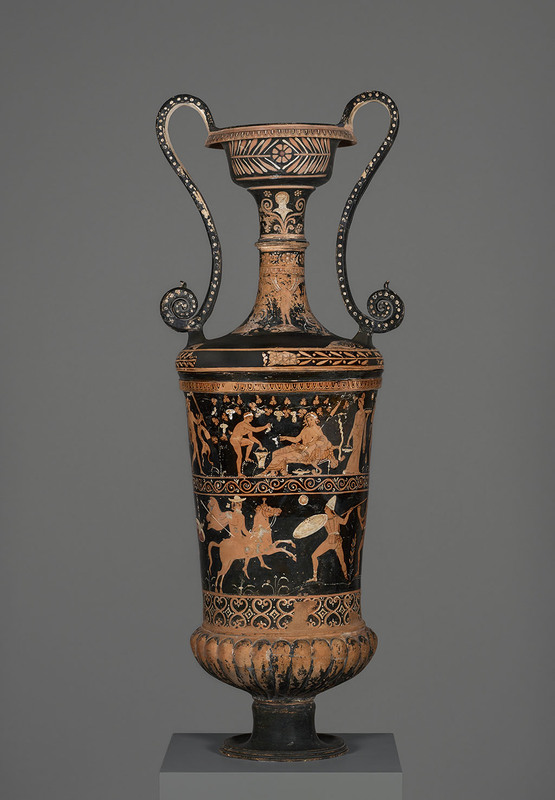 These magnificent vases offer so much for exploration and discussion: their elaborate iconography and Apulian burial customs; the hotly debated issue of how ancient artefacts should be restored; and the many decisions that lie behind their newly conserved state,” explains David Saunders, curator of the exhibition and associate curator of antiquities at the J. Paul Getty Museum. Funerary Vessel , South Italian, from Apulia, 340-310 B.C., terracotta red-figured volute krater attributed to the Phrixos Group. Image © Staatliche Museen zu Berlin, Antikensammlung. Photo: Johannes Laurentius. 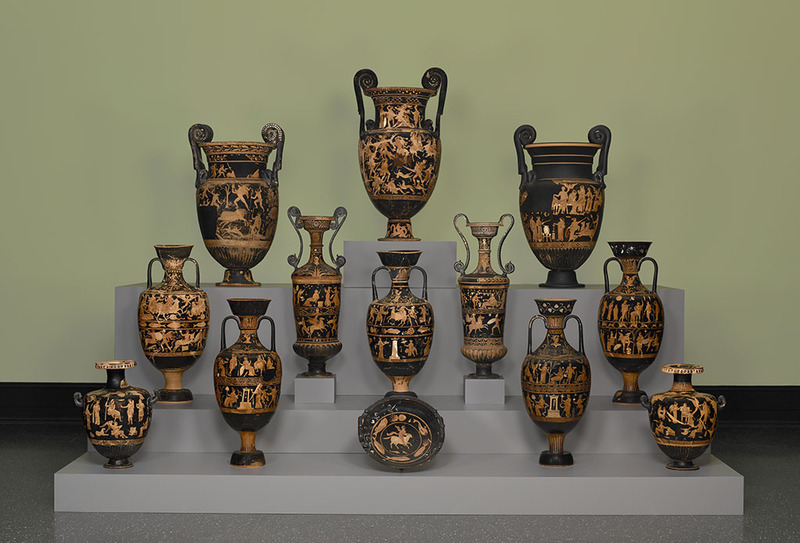 Dangerous Perfection: Funerary Vases from Southern Italy was organized by the J. Paul Getty Museum in collaboration with the Antikensammlung, Staatliche Museen zu Berlin. 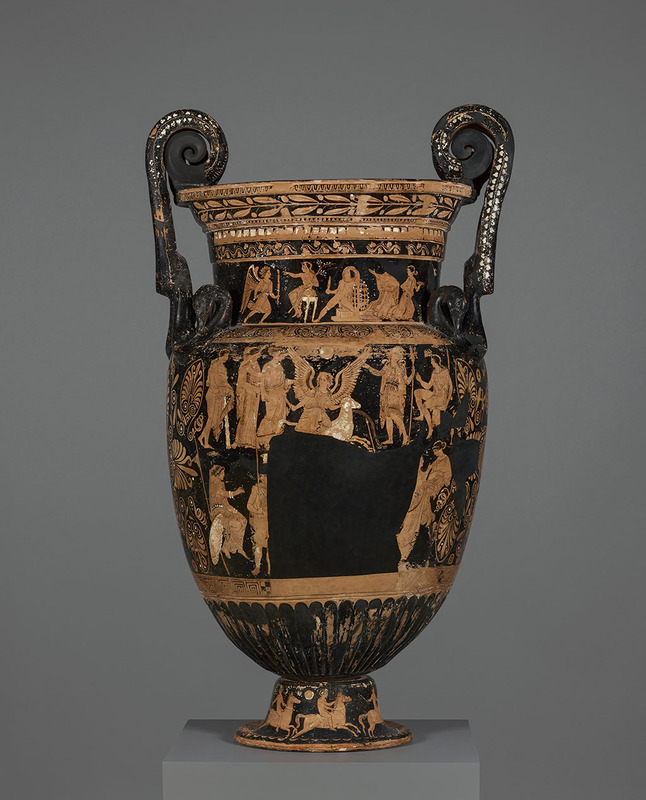 The exhibition is curated by David Saunders, associate curator of antiquities at the J. Paul Getty Museum. Generous support for the conservation project and the exhibition was provided by the Getty Museum’s Villa Council. Funerary Vessel, South Italian, from Apulia, 350-325 B.C., terracotta red-figured loutrophoros attributed to the Darius Painter. Image © Staatliche Museen zu Berlin, Antikensammlung. Photo: Johannes Laurentius. Funerary Vessel (detail), South Italian, from Apulia, 350-325 B.C., terracotta red-figured loutrophoros attributed to the Darius Painter. Image © Staatliche Museen zu Berlin, Antikensammlung. Photo: Johannes Laurentius. Assemblage of 13 funerary vessels found at Ceglie del Campo, near Bari in Apulia, Italy. Image © Staatliche Museen zu Berlin, Antikensammlung. Photo: Johannes Laurentius.